Based in sunny Southern California, Petal Fresh was started by a group of passionate individuals pursuing a more natural and healthy lifestyle. At Petal Fresh, they believe that what you put on your body is just as important as what you put in it. They infuse their formulas with the most natural, Certified Organic ingredients to create effective high-quality products, naturally. Transform even the most parched and damaged hair with Petal Fresh Pure Seaweed & Argan Oil Shampoo. 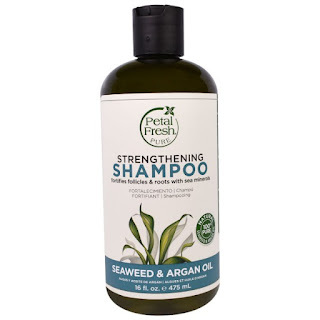 Certified Organic Seaweed restores strength to hair follicles and roots with nourishing sea minerals while Certified Organic Argan Oil seals in moisture for softer, shinier hair. Seaweed, one of the most mineral-rich plants on Earth, draws an extraordinary wealth of mineral elements from the sea. Combined with Argan Oil, this ultra-nourishing blend strengthens hair for lasting vitality and elasticity. Hair is once again strong and pliable. Apply to wet hair from the roots up. Rinse thoroughly. For best results, follow with Petal Fresh Pure Seaweed & Argan Oil Conditioner. Transform even the most parched and damaged hair with Petal Fresh Pure Seaweed & Argan Oil Conditioner. Certified Organic Seaweed restores strength to the hair follicles and roots with nourishing sea minerals while Certified Organic Argan Oil seals in moisture for softer, shinier hair. Seaweed, one of the most mineral-rich plants on Earth, draws an extraordinary wealth of mineral elements from the sea. Combined with Argan Oil, this ultra- nourishing blend strengthens hair for lasting vitality and elasticity. Hair will be like new again. Wouldn't that be nice? I think so. Apply to freshly washed hair, focusing on the ends. Leave on as long as desired. Rinse thoroughly with warm water. For best results, use with Petal Fresh Pure Seaweed & Argan Oil Shampoo. These products are available through www.iherb.com, not through www.petalfresh.com. Most Petal Fresh products are available through Petal Fresh though. The products are very nice products and work very well at helping to strengthen the hair.